The Cyclone Ride goes to Coney Island Amusement Park (Brooklyn) from Manhattan. In July and August, we should get there just in time for fireworks! This is a casual ride at a relaxed pace. Bring locks as we plan to lock up and ride the rides. Bring money for food and amusements, and a swimsuit if you plan to hit the waves. We usually spend about an hour and a half in the park, on the beach (and in the water! 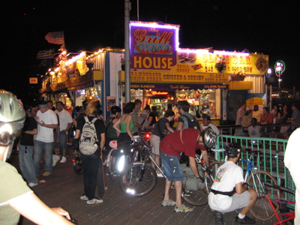 ), on the boardwalk, and at Nathan's, and everyone has a GREAT time! 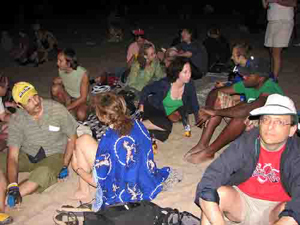 Some people return on the subway, and others ride back in informal groups. Rain cancels. 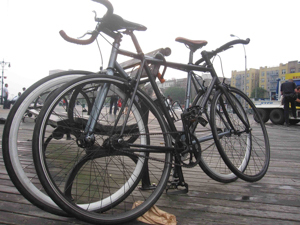 8:00 at the 69th Street Pier in Brooklyn at the Shore Parkway bicycle path entrance (take 68th Street past Owl's Head Park and bear right).